Rajhesh Vaidhya (or, Vaidya), is an Indian veena player. Rajhesh Vaidhya is a highly capable musician in India and has performed on stages around the world including Europe, Brazil, South Africa, Australia, Singapore, Malaysia, Mauritius, Canada, USA and many more. He has even performed with an experimental dance troupe based in Switzerland. Apart from his blistering speed, Rajhesh’s veena playing is distinguished by his use of electric or amplified strings. He has worked with various film music composers. He also acted in the movie Viswa Thulasi and in Premi, a tele-serial. 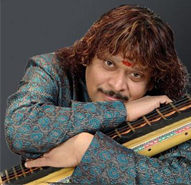 Rajesh Vaidya has composed various albums and given many stage performances. He was music director for the movie Vegam by S.Ve.Shekher, starring Ashwin Shekher. He has also worked with Vidyasagar, Harris Jeyaraj, Bharadhwaj, Deva, Devi Sri Prasad and Srikanth Deva. He composed the music for K. Balachander's Sahana, a television series. He collaborated with Playing for Change, on the album Songs Around The World, (2008). Vaidhya was a winner of the 2010 Kalaimamani award for his veena playing. From a very tender age, he started his tutelage under Smt. Jeyalakshmi and continued receiving teaching of the Saraswathi Veena under Smt Rama Nambinarayanan. He also received advance training under the world-renowned carnatic veena maestro Shri Chitti Babu.